A megalith is a large stone that has been used to construct a structure or monument, either alone or together with other stones. The word "megalithic" describes structures made of such large stones without the use of mortar or concrete, representing periods of prehistory characterised by such constructions. For later periods, the term monolith, with an overlapping meaning, is more likely to be used. The word "megalith" comes from the Ancient Greek "μέγας" (transl. megas meaning "great") and "λίθος" (transl. lithos meaning "stone"). Megalith also denotes an item consisting of rock(s) hewn in definite shapes for special purposes. It has been used to describe buildings built by people from many parts of the world living in many different periods. A variety of large stones are seen as megaliths, with the most widely known megaliths not being sepulchral. The construction of these structures took place mainly in the Neolithic (though earlier Mesolithic examples are known) and continued into the Chalcolithic and Bronze Age. Dolmens and standing stones have been found in large areas of the Middle East starting at the Turkish border in the north of Syria close to Aleppo, southwards down to Yemen. They can be encountered in Lebanon, Syria, Iran, Israel, Jordan, and Saudi Arabia. The largest concentration can be found in southern Syria and along the Jordan Rift Valley, however they are being threatened with destruction. They date from the late Chalcolithic/Early Bronze Age. Megaliths have also been found on Kharg Island and pirazmian in Iran and at Barda Balka in Iraq. 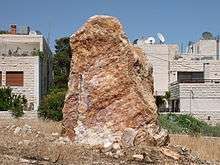 Standing stone in Amman, Jordan, now destroyed. 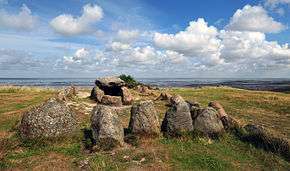 The most common type of megalithic construction in Europe is the portal tomb – a chamber consisting of upright stones (orthostats) with one or more large flat capstones forming a roof. Many of these, though by no means all, contain human remains, but it is debatable whether use as burial sites was their primary function. 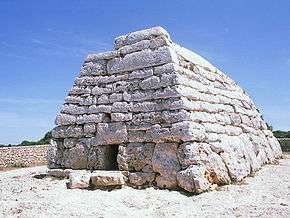 The megalithic structures of Malta are believed to be the oldest in Europe, in particular Skorba Temple. 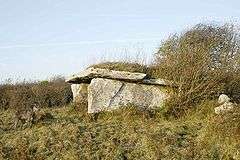 Though generally known as dolmens, the correct term accepted by archaeologists is portal tomb. 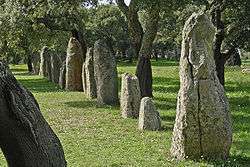 However many local names exist, such as anta in Galicia and Portugal, stazzone in Sardinia, hunebed in the Netherlands, Hünengrab in Germany, dysse in Denmark, and cromlech in Wales. It is assumed that most portal tombs were originally covered by earthen mounds. 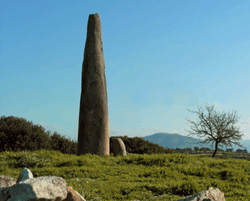 In Italy, dolmens can be found especially in Sardinia. 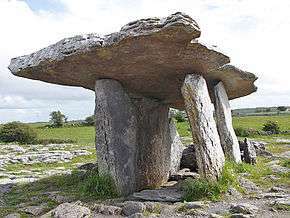 There are more than 100 dolmen dating to the Neolithic (3500-2700 BC) and the most famous is called Dolmen di Sa Coveccada (near Mores ). 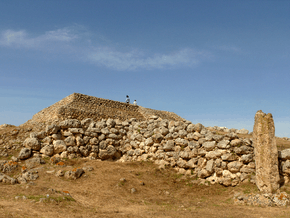 During the Bronze Age, the Nuragic civilization built c. 800 Giants' grave, a type of megalithic gallery grave that can be found throughout Sardinia with different structures. 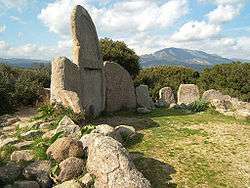 The earliest megalithic tombs in Sardinia are the circular graves of the so-called Arzachena culture, also found in Corsica, southern France and eastern Spain. 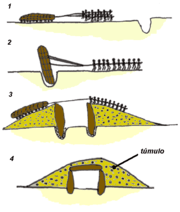 Dolmen are also in Apulia and in Sicily. In this latter region, they are small structures located in Mura Pregne (Palermo), Sciacca (Agrigento), Monte Bubbonia (Caltanissetta), Butera (Caltanissetta), Cava Lazzaro (Siracusa), Cava dei Servi (Ragusa), Avola (Siracusa), Argimusco in Montalbano Elicona (Messina) . 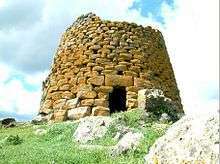 Dating to the early Bronze Age (2200-1800 BC), the prehistoric Sicilian buildings were covered by a circular mound of earth. 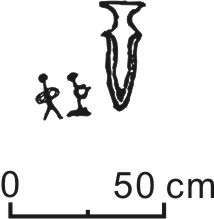 In the dolmen of Cava dei Servi, the archaeologists found numerous human bone fragments and some splinters of Castelluccian ceramics (Early Bronze Age) which confirmed the burial purpose of the artefact. 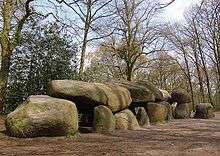 In Europe megaliths are, in general, constructions erected during the Neolithic or late stone age and Chalcolithic or Copper Age (4500-1500 BC). 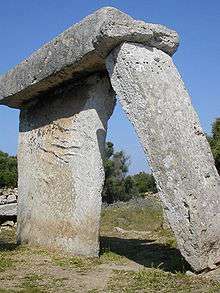 The megalithic structures of Malta are believed to be the oldest in Europe. 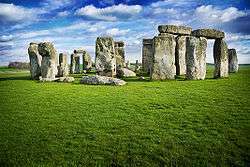 Perhaps the most famous megalithic structure is Stonehenge in England. 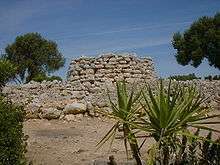 In Sardinia, in addition to dolmens, menhirs and circular graves there are also more than 8000 megalithic structure made by a Nuragic civilisation, called Nuraghe : buildings similar to towers (sometimes with really complex structures) made using only rocks. They are often near giant's grave or the other megalithic monuments. The French Comte de Caylus was the first to describe the Carnac stones. Pierre Jean-Baptiste Legrand d'Aussy introduced the terms menhir and dolmen, both taken from the Breton language, into antiquarian terminology. He mistakenly interpreted megaliths as gallic tombs. In Britain, the antiquarians Aubrey and Stukeley conducted early research into megaliths. In 1805, Jacques Cambry published a book called Monuments celtiques, ou recherches sur le culte des Pierres, précédées d'une notice sur les Celtes et sur les Druides, et suivies d'Etymologie celtiques, where he proposed a Celtic stone cult. This completely unfounded connection between druids and megaliths has haunted the public imagination ever since. In Belgium, there is a megalithic site at Wéris, a little town situated in the Ardennes. In the Netherlands, megalithic structures can be found in the northeast of the country, mostly in the province of Drenthe. Knowth is a passage grave of the Brú na Bóinne neolithic complex in Ireland, dating from c.3500-3000 BC. It contains more than a third of the total number of examples of megalithic art in all Europe, with over 200 decorated stones found during excavations. Megalithic burials are found in Northeast and Southeast Asia. They are found mainly in the Korean Peninsula. They are also found in the Liaoning, Shandong, and Zhejiang in China, the East Coast of Taiwan, Kyūshū and Shikoku in Japan, Đồng Nai Province in Vietnam and parts of Pakistan and India. Some living megalithic traditions are found on the island of Sumba and Nias in Indonesia. The greatest concentration of megalithic burials is in Korea. Archaeologists estimate that there are 15,000 to 100,000 southern megaliths in the Korean Peninsula. Typical estimates hover around the 30,000 mark for the entire peninsula, which in itself constitutes some 40% of all dolmens worldwide (see Dolmen). The Punden step pyramid and menhir can be found in Pagguyangan Cisolok and Gunung Padang, West Java. 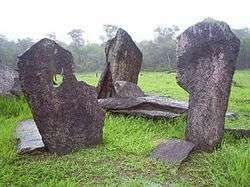 The Gunung Padang Site is the biggest megalithic site in Southeast Asia. 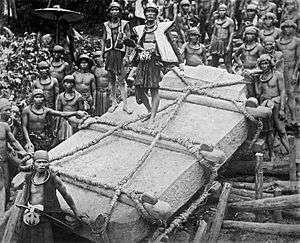 The Cipari megalith site also in West Java displays monoliths, stone terraces, and sarcophagi. The basic design of later Hindu-Buddhist temples structure in Java after the adoption of Hinduism and Buddhism by the native population has the punden step pyramid concept underlying. The 8th century Borobudur and 15th-century Candi Sukuh, for example, featured the step-pyramid structure. 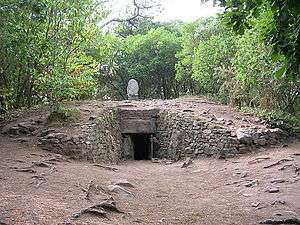 A study mentions living megalithic practices amongst the Madia Gonds. The Madia Gonds live in Bhamragad Taluka of Gadchiroli District of Maharashtra, India. Megalithic structures in Micronesia reach their most developed form on the islands of Pohnpei and Kosrae in the Eastern Caroline Islands. On these two islands there was extensive use of prismatic basalt columns to build upland building complexes such as those at Salapwuk on Pohnpei and Menka on Kosrae. These building sites, remote from the ocean, appear to have been abandoned early. Megalithic building then shifted to constructing networks of artificial islands on the coast that supported a multitude of common, royal and religious structures. Dating of the structures is difficult but the complex at Nan Madol on Pohpei was probably inhabited as early as 800 c.a. probably as an artificial islands with the more elaborate buildings and religious structures added to the site from 1000 - 1400 c.e. Nan Madol almost certainly served as the economic, government and religious site for a centralized monarchy which is historically named the 'Saudeleurs'. By legend the Saudeleurs were from elsewhere, possibly in the south or west but no specific origin has ever been established. Nan Madol lost prominence and was later abandoned after the overthrow of the Saudeleur dynasty. The oral history suggests this overthrow was by a group of warriors from Kosrae. The megalithic site at Lelu on the island of Kosrae, based on dating studies and oral history, rose to prominence about 1400 c.e. corresponding roughly with the fall of Nan Madol and endured for the next three hundred years or so. It was largely abandoned by the time of European contact. The architecture at these Micronesian sites is characteristic and has little in common with other megalithic sites. Prismatic basalt columns were brought from a great distance to the artificial islands and the rock was stacked in a layers of stretchers and runners filled in the center with coral debris. This structure allowed creation of walls up to 10 meters in height with great durability. The presence of step pyramids in the south western corner of Nan Madol as well as in Lelu suggests some Melanesian influence but other structures such as the royal residence, the religious structures and common areas as well as the elaborate interconnecting system of canals has no parallel elsewhere in the Pacific region. 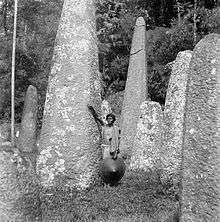 Megaliths were used for a variety of purposes ranging from serving as boundary markers of territory, to a reminder of past events, and to being part of the society's religion. Common motifs including crooks and axes seem to be symbols of political power, much like the crook was a symbol of Egyptian pharaohs. 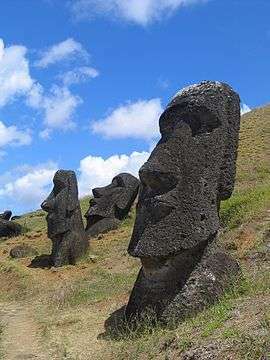 Amongst the indigenous peoples of India, Malaysia, Polynesia, North Africa, North America, and South America, the worship of these stones, or the use of these stones to symbolize a spirit or deity, is a possibility. In the early 20th century, some scholars believed that all megaliths belonged to one global "Megalithic culture" (hyperdiffusionism, e. g. 'the Manchester school', by Grafton Elliot Smith and William James Perry), but this has long been disproved by modern dating methods. 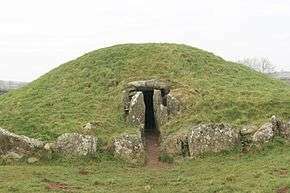 Nor is it believed any longer that there was a European megalithic culture, although regional cultures existed, even within such a small areas as the British Isles. 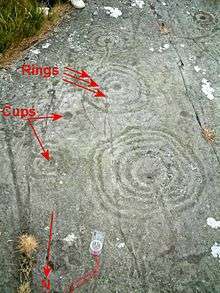 The archaeologist Euan Mackie wrote "Likewise it cannot be doubted that important regional cultures existed in the Neolithic period and can be defined by different kinds of stone circles and local pottery styles (Ruggles & Barclay 2000: figure 1). No-one has ever been rash enough to claim a nationwide unity of all aspects of Neolithic archaeology!" 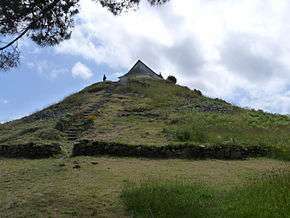 Punden or Punden Berundak: step earth and stone pyramid, similar to tumuli but enforced with stone walls. ↑ Glossary. McGraw-Hill Higher Education. ↑ Glossary Archived September 17, 2005, at the Wayback Machine.. wordnet.princeton.edu. ↑ "Louisenlund tæt ved Østermarie på Bornholm", Europage.dk. (Danish) Retrieved 14 November 2012. ↑ J. Clendenon. "Nabta". Retrieved 2007-03-21. ↑ |Lore Lindu National Park, Central Sulawesi. Hiscock, P (1996). "The New Age of alternative archaeology of Australia". Archaeology in Oceania. 31 (3): 152–164. doi:10.1002/j.1834-4453.1996.tb00358.x.